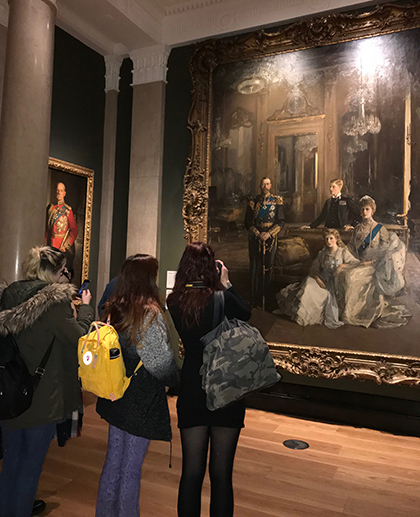 Aspiring artists from The Sixth Form College, Solihull gained inspiration from celebrated artists last week when they visited the National Gallery and the Portrait Gallery in London. Students on the BTEC Art & Design course went on the trip to see the work on exhibition at two of the best galleries in the country. What they saw demonstrates many techniques in painting that they themselves can use in their portfolio of coursework. The visit also enabled them to explore in more detail the style of some of the world’s most famous artists, which can inspire their own original works. At the National Gallery they saw famous works by artists like Cézanne, Monet, Michelangelo, Rubens, Rembrandt, van Gogh, Turner and Constable. Some of the most famous works they saw included “Sunflowers” by Vincent van Gogh, “Samson and Delilah” by Peter Paul Rubens and “Bathers at La Grenouillère” by Claude Monet. At the National Portrait Gallery, highlights included 19th century portraits by Cézanne and a new collection of early 20th century portraits including paintings of Virginia Woolf, Sir Winston Churchill, King George V, Roald Dahl and Sir Ernest Shackleton. Photography is also exhibited at the National Portrait Gallery.